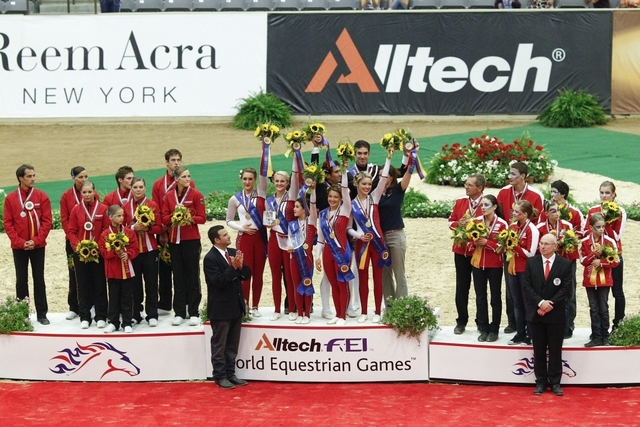 The host nation claimed the Team title in the Vaulting Championships at the Alltech FEI World Equestrian Games™ in Kentucky, USA today. Pictured on the podium are (centre) USA - gold, (left) Germany - silver, and (right) Austria - bronze. Photo: FEI/Kit Houghton. The host nation held their nerve and really rose to the occasion today to win the Team title in the Vaulting Championships at the Alltech FEI World Equestrian Games™ in Kentucky, USA. On Friday their Freestyle routine fell apart when their horse, Palatine, became anxious in the arena and they had to settle for third place as a result. But today it all came together beautifully, and to the theme of Romeo and Juliet, with Rosalind Ross and Devon Maitozo playing the lead roles, they rocketed back up the leaderboard to steal gold. Vaulting has been a major crowd-puller at the Kentucky Horse Park, and the sport looks set to go from strength to strength in the US having received extensive coverage throughout the week in the media. Maitozo said the benefit of highlighting it through inclusion in the Alltech FEI World Equestrian Games™ has been immeasurable - "this has been an amazing opportunity to put our sport on the map in the US" he pointed out. The Austrians, last to go in today's competition, were delighted when taking bronze. Team manager Klaus Haidacher said the team target was to take a medal - "it has been very expensive bringing six horses and 30 people to the Games, but we go away with a big smile now that we have succeeded!" he pointed out. Their routine was themed around the Cirque du Soleil - "we like the music and we like the performance of the Cirque du Soleil because it is exciting and entertaining" said Austrian team member Daniela Penz. Rosalind Ross talked about the US Freestyle routine. "It is loosely based around the Shakespearean play, Romeo and Juliet, and we have tried to embody the essence of the play" she explained. Asked what felt best about this great home-side result, Maitozo replied "the most amazing thing is to share this moment with my team and our horse, Palatine". The Westphalian gelding was found by Maitozo on a horse-hunting trip to Germany in 2007. "He is an elegant, accepting, calm and loving horse and I took to him immediately when I saw him" the American vaulter explained. He was not chosen as a team ride, however - Palatine was initially selected for use in individual competition. "He's narrow, so I never imagined him being a team horse, but then my other horse had an accident and he had to be put down so Palatine was the only horse left and he accepted it when we tried using him for the team - I was pretty surprised!" Maitozo explained. There is a significant age gap between the US team members - Maitozo is 34 while the youngest team member is 14 year old Emily Hogye. "This is one of the great things about our sport" Maitozo said. "When we are together we support each other like a family. Vaulting has this unique aspect to it" he added. Asked how it felt to be a gold medal winner at such a tender age, Hogye replied "it's kinda cool to be on a team with people who are so experienced because you learn a lot - not just about vaulting, but about everything else in life! ".